That’s Robert De Niro’s Neil McCauley, a professional thief leading an insular life in Michael Mann’s 1995 crime classic, Heat. It’s the kind of attitude you need when your idea of a good time is driving a truck into an armoured car to steal 1.6 million dollars. Especially when a rouge member of your team, Waingro (Kevin Gage), murders one of the guards, necessitating killing the other two to avoid leaving witnesses. McCauley’s philosophy is his self-preservation mechanism, designed to prevent his capture and imprisonment. That is, however, what the tough snap-at-any-moment cop, Vincent Hanna, played by Al Pacino, most desires. He, like McCauley, is equally detached from others. He prefers to keep company with the criminals he hunts so obsessively. This pleases neither his wife, Justine (Diane Venora), nor his attention deprived step-daughter (Natalie Portman, in her second film). McCauley, despite knowing Hanna is monitoring their every move, subsequently plans a 12 million dollar heist in Downtown L.A. This sets the scene for a phenomenal extended action sequence. Its virtuosity is in its technicality: the way Mann shoots it with frequent POV shots, Elliot Goldenthal spare percussive musical score. It’s cold, epic and brutal with a grim sense of reality. It’s here that Blu-ray comes into its own, with the thunderous automatic weapon fire rattling all 5.1 channels. But though it may have been marketed as one, Heat is no action picture. It is instead a layered portrait of two men on either side of the law, both trying and failing to have it all. It deals specifically with their relationship to their women: Hanna to Justine, McCauley to his new girlfriend Eady (Amy Brenneman), and Chris (Val Kilmer), another member of McCauley’s team, to Charlene (Ashley Judd). They try but fail, the most long lasting kinship developing between the two lead adversaries. It’s perverse that Mann casts two megastars and yet keeps them apart bar one central scene. Taking a break from pursuing each other, Hanna and McCauley stop at a coffee shop and discuss each other in matter-of-fact, detached words. By their own admission, they are two sides of the same coin. Heat is epic. Not in the same way as The Lord of the Rings or Lawrence of Arabia, but epic in the scope of its depiction of the cops and robbers circulating the underbelly of Los Angeles. There are at least half a dozen more significant characters that flesh out the world, including William Fichtner as an out-of-his-depth businessman and Jon Voight as one of McCauley’s few trusted associates, but the one that looms largest is the city itself. It’s an L.A. of greys and blues, one where the line between good and evil is not clearly defined. While it’s disappointing that this release has no Blu-ray specific special features – they are the same that featured on the 2-disc DVD – they themselves are excellent. There’s a commentary by Mann, which is not wall-to-wall but interesting, eleven deleted scenes and five documentaries. The featurettes are a mixture of 1995 interviews and retrospectives created around the time of the release of the original DVD. 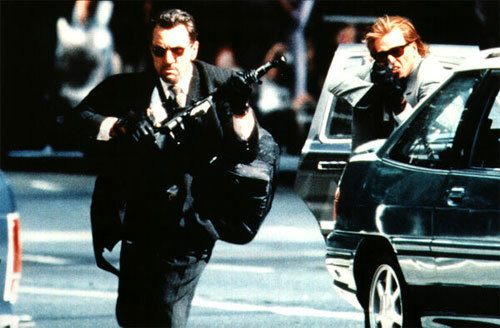 There’s about an hour worth of material, the best of which are “Crime Stories” and “Into the Fire”, which give an in depth discussion of the film’s long gestation period (Mann couldn’t get it financed until shooting a TV movie on the same subject called L.A. Takedown), training the cast to use automatic weapons, shooting the climactic battle and the choice of soundtrack. 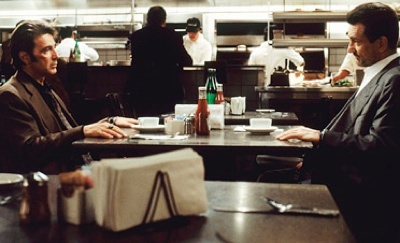 Much of the cast and crew, including Mann, De Niro, Pacino, Kilmer, Judd and Tom Sizemore are interviewed. These extras are unsurprisingly presented in full-frame SD. The quality of the feature presentation is, however, splendid and a perfect match of Mann’s uncomplicated style. The washed out cold tones don’t leap out at you as some other, more flashy films, but it’s beautiful and understated, a perfect reflection of the characters and of a Los Angeles divorced from its typical sunny, Hollywood image. It’s this layered depiction of the city and its two damaged protagonists that elevate what could have easily been a simplistic heist movie. 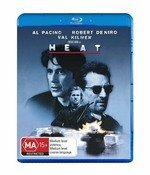 Heat is a modern classic.